The quickest, most powerful and most track-focused – yet road legal – Sports Series McLaren made its Bahrain debut at the McLaren Bahrain Showroom in Tubli today. The arrival of the new 600LT, which is built to excel on roads and race circuits alike, marks both the beginning of the next chapter in the McLaren ‘Longtail’ (LT) story and the setting of a new benchmark for super-sportscar performance, the company said. The new McLaren 600LT epitomises the McLaren philosophy of producing lightweight super-sportscars that deliver extreme performance and are exceptionally rewarding to drive. With the engine management system of the 3.8-litre twin-turbocharged V8 recalibrated and less back pressure from a top-exit exhaust system that is even shorter and more extreme than that of the McLaren Senna allowing the engine to breathe more freely, the 600LT can call on peak power of 600PS (592bhp) at 7,500rpm and a maximum torque output of 620Nm (457lb ft) at 5,500-6,500rpm. These outputs deliver astonishing levels of performance: 0-100km/h (62mph) takes just 2.9 seconds, matching the acceleration of the revered McLaren 675LT Super Series model. 0-200km/h (124mph) is achieved in a remarkable 8.2 seconds and the 600LT can continue gathering speed to a top speed of 328km/h (204mph). Inspired by the renowned McLaren 675LT models and their iconic ‘Longtail’ McLaren F1 GTR racing predecessor, the new addition to the LT family has all the physical hallmarks of a true McLaren ‘Longtail’, including an extended front splitter, lengthened rear diffuser, fixed rear wing and elongated silhouette – in this case by 74mm compared to a McLaren 570S Coupé. The unique bodywork optimises aerodynamic performance, working in conjunction with the flat carbon fibre floor of the 600LT to produce the 100kg of downforce at 250km/h (155mph) that generates more grip and greater high-speed stability and is a significant contributor to the car’s excellence on a track. Extensive use of carbon fibre – including for the monocoque chassis that is some 25 per cent stiffer than a comparable aluminium chassis and for the new aerodynamic features– together with lightweight materials throughout the track-focused cockpit, helps the McLaren 600LT to achieve a lightest dry weight of 1,247kg and equivalent power-to-weight ratio of 481PS/tonne. With the optional Super-Lightweight Carbon Fibre Racing Seats developed for the McLaren Senna fitted, the 600LT weighs 100kg less than a 570S Coupé – a remarkable reduction that delivers tangible benefits in every aspect of the car’s performance. The remit of any McLaren ‘Longtail’ model is to engage and excite to the absolute maximum, encouraging – and enabling – drivers to fully exploit the dynamic performance inherent in the car. The ethos underpinning every aspect of the development of the McLaren 600LT was therefore a determination to deliver the purest possible connection between car and driver. To this end, the 600LT has lighter and stiffer suspension components from the McLaren 720S, the adoption of the forged aluminium double wishbones and uprights not only improving dynamic capabilities, but also reducing weight by 10.2kg. Ride height is reduced by 8mm over other Sports Series models and front track is increased by 10mm, to deliver a more precise driving experience. The independent, continuously variable adaptive dampers and front and rear anti-roll bars featuring on all McLaren Sports Series models have been retained but are significantly re-engineered to work with the new suspension geometry and create the track-focused performance demanded of the new 600LT. The adoption of the braking system from the McLaren Super Series, which features lightweight aluminium calipers and stiffer carbon ceramic discs, reduces weight by 4 kg, working in conjunction with an all-new brake booster developed using learnings from the McLaren Senna, the result is incredibly responsive and progressive pedal feel during braking and a 200km/h (124mph) to standstill distance of 117m – just 1m more than a McLaren P1. Two new designs of ultra-lightweight aluminium alloy wheels – 10-spoke as standard and a 5-spoke alternative option – are the lightest wheels ever fitted to a Sports Series, the reduction in unsprung weight bringing a noticeable benefit to the dynamic qualities of the car. The cockpit of the McLaren 600LT exemplifies both weight reduction and a driver-focused environment. Lightweight Alcantara trim material is used extensively throughout and the absence of carpet in the driver and passenger footwells and beneath the seats saves 5.7 kg, while also exposing the carbon fibre beauty of the MonoCell II chassis construction. 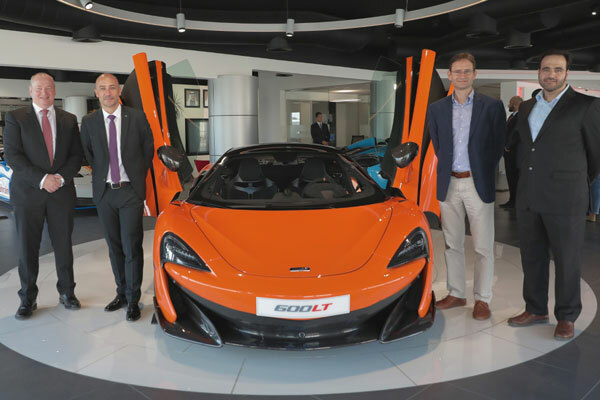 Production of the 600LT Coupé began in October 2018 and will last for around 12 months, with build slots scheduled around existing Sports and Super Series models, as well as the sell-out Senna, Senna GTR and BP23. Availability will be strictly limited, the carbon fibre body panels that require specialist tooling just one of the reasons that the new ‘Longtail’ will be rarer than its Sports Series brethren.